I had the awesome opportunity to make a quilt from Barb and Mary’s new book, Precut Primer. I was excited to take a look at their new book and sew from it, for two reasons. The second reason I wanted to sew from their new book is because last spring, as a new Moda designer, Barb and Mary were one of the first people to say hi, and welcome to the Moda family. They were gracious, and funny, and I can’t say how much I appreciated that. It was intimidating coming to set up, and wondering if the other designers really dislike new designers, or if there’s a competitive thing going on, you know. But there wasn’t. Especially from them. So I wanted this to be a bit of a thank you as well. Thanks ladies. You’re pretty darn great. For that matter, so is this book. It has 12 projects, one for each school year. I chose to do the Second Grade quilt, because I let Lily pick which one I should do, and she and Beckham just started Second grade. It was a perfect ploy actually because I was trying to talk myself into choosing one of the simpler quilts, and was feeling bad for “copping out”. Iknew if I left it up to Lily she’d choose 2nd grade (for obvious reasons), which happens to be the 2nd easiest quilt in the book…which was just perfect for the amount of sewing time I had. The other good thing? The guilt over not choosing a harder quilt was gone because it made Lily so happy to be choosing which one I’d do! Normally I don’t have much of a problem choosing the project to do in a book. Normally there are only one or two I like in the first place. Not so in this book. I could easily see myself making 5 or 6 of the quilts here. This is the first “quilt” I’ve made since Hazel was born, and it was the perfect project for jumping back in. It took less than a day to make, even with lots of “baby needs mama” breaks, and even sewing with a tiny one on my lap. It was fast, and painless, and turned out oh so darling. I nearly forgot! If you’d like to win some Meadowbloom, (and who doesn’t?) leave a comment telling me which grade was your favorite, and why. I’ll choose a winner on Tuesday the 8th of September–so get your comment in before 11:59pm on the 7th. And be sure to follow me on Instagram and Facebook for more chances to win. This one is really a beauty!! And I’m positively stunned that you were able to do it AT ALL, nevermind in one day. Good for you. Looks like life is finding it’s rhythm with that new little sweetness. Good, good job…on all of it, honey. This is very cute! I love the binding. Perfect for a mini quilt. And the quilting – very effective. I’ve never even thought about which grade was my favourite. I think it probably was grade 2. I had a wonderful and pretty young teacher and lots of friends. It was a warm and cozy year. Your quilt is so sweet. I have a bundle of Meadowbloom looking for the perfect pattern(s). senior year – only had to go to school for half a year – early graduation! Third grade was great. My teacher liked my art work! Your quilt is so cute. I love it! 4th grade was my favorite because my teacher was also a crafter and we had some pretty great art projects. Mr. Easterday…7th grade science…he let us cut open a fetal pig! Awesome then…gross now! I loved 9th grade because it was the first year I could pick classes I wanted. Your quilt is awesome! Favorite grade was kindergarten, lots of playtime and reading time! Senior year high school-on my way to college!and wondering what the future will bring. Love that second grade quilt-would like to make it in a bigger version! I loved 4th grade. Lots of friends in my class and it just seemed like the world was wonderful–great times at recess and lunch–don’t remember learning all that much though! I loved Grade 6! Lots of time to read and enjoy learning! We had long recess periods and we went home for lunch! I loved 7th grade. That’s when we took home ec, and I loved it! And so began my love of sewing. Thanks for the giveaway! This is like asking which is your favorite child! I loved 1st grade. Mrs. Roby was an awesome teacher, and really cemented my love for school. 5th grade was a favorite too, because of Mrs. Montgomery (Reading, Writing and Language) and Mr. Travelstead (Math, Science and Social Studies.) I adored 7th grade because of Mrs. Righthouse (Science) and Mrs. Gillespie (English). And, of course, 12th grade was a blast because Senior Year and I got to take all the classes I adored (English and History) and no Math or Science. Now if I had to pick a year I hated, that would be 9th grade hands down! Teen angst was so hard that year. Loved first grade! I felt like such a big kid! 9th grade, I met my husband, we have been married 51 years. I liked 9th grade best – we were the first class to go all the way through our brand new high school which was designed to seem like a college campus. Felt grown up. HI,such a cute Quilt! First Grade was my favorite>I loved making new friends!Thanks for a sweet giveaway! I think my senior year of high school was my favorite. I kind of grew into my nerdiness once I would take advanced classes. Oh my, that was a long time ago! But 6th grade was one of my favorites! Though I had a tough teacher, she respected us and expected much and prepared us for junior high. I loved language and reading and what both teachers picked to read to the class has stayed with me as some of my all time favorite books. Favorite grade was 6th–with Mr. Goodwin!! Love! I need this book. My favorite year was first grade. I had the sweetest teacher ever! Fourth grade was my favorite, because I had the best teacher ever, Mrs. Gross. She was very nice & took me under her wing, after I had a seriously awful third grade teacher. Thanks. We just got these fabrics into the shop yesterday and I love them! The background is so cute! I had the best year in grade 11 – definitely my favorite. Mostly because I had fun with my friends :0) Your fabric line looks amazing in this pattern. My favorite grade was my senior year. I was Yearbook Editor and spent a lot of time in the lab working on our yearbook. My favourite grade was 3rd because we had the most amazing teacher who treated us differently, and he had so many interesting events and programs. It was through him that I started writing comic books and that lasted for a couple of years!! He was the first teacher that addressed us with the term “people” not boys and girls as we were used to!!! How cool is that??!! Anyway, I love your quilt, those colours are gorgeous!! I like 6th grade best. It was the first year we had a male teacher. I remember 8th, 9th, and 11th grades being lots of fun, but I liked 12th grade the very best! I wouldn’t want to do it all again, though! I think 2nd grade was my favorite. I had a pretty, young teacher who got married over Christmas vacation & then brought her wedding pictures in for us to see. I have fond memories of 3rd grade. It was the year that we learned to write in cursive and we used a fountain pen! I used peacock blue ink and it was lovely! I enjoyed many grades, but I will pick fourth grade as that is when I started learning to play the violin. Second grade was a favorite. My teacher, Mrs. Scopolite, taught us a song and I used to sing it at home every morning for several years. I still remember the tune and the words after 50+ years. My older sister brings this up every once in a while. She also remembers me singing it every single morning. Definitely my senior year of high school was my favorite….I only had 4 classes, I was a cheerleader, and I had a fabulous boyfriend. Life was good. Thank you for the chance to win. My favorite year was sixth grade. My teacher asked me to design and make an art project for her to take to a teacher’s workshop. I think that acknowledgement of my artistic ability that has kept me interested in making craft projects and sewing/quilting. Thanks for the chance to win. I always liked school, no matter what grade. Not sure I have a favorite. College was better than any of them though. My favorite was the 11th grade! 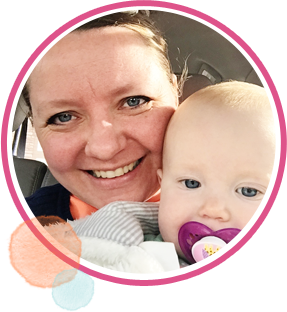 Fun friends and fun classes! I liked 6th. grade the best because, for the first time, we had different teachers for different subjects. It was like we were growing up and becoming the “older kids”. I love your Meadowbloom line! First grade was my favorite! I loved my teacher and have many good memories. I liked my 5th grade year. I had an excellent teacher who was teaching past the normal retirement age because she loved teaching. I was really glad to have the opportunity to be her student. I just liked you on facebook so am a new follower. My favorite grade for 3rd grade with Mrs. Norris. She read to use every Friday afternoon – I think she is the reason I got addicted to reading. I think it was 7th grade. It was exciting to move up to Junior High, ride a bus to school, and have a locker. I met one of my best friends then and I had the best principal (who happened to be my friend’s father). Then there was French class. So many new things. You made a great quilt. My Favorite grade was 9th grade. I know It is along way away from the elementary years but it was the time of my life. I was at a new school, had a great boyfriend, and it was the year I was the Freshman Homecoming court attendant and my sister was the Homecoming queen! I loved this moment because my Grandfather walked me down the football field and I loved him very much. Its just a memory I will cherish. My favourite Grade was Grade 3, new school, new community and new friends, and my own bedroom. One day? Wow! Well done! I love the little peeks of colour from the background. I loved seventh and eleventh grades the best! I’d say college but I think I will love this book. nice and easy to do,i’ll try soon.love from france so far from you! Your version of 2nd grade is wonderful. The circular quilting makes it sort of hypnotic. My favourite grade at school was grade 1. I have the best teacher and school was fun. I don’t have many memories of school, but 12th grade I had a lot of fun! School work, nope… I wish I could have a do-over now, though. LOL! Love the binding, and adore this range, it’s beautiful. I liked 3rd grade, great teacher and a fun age too! My favourite grade was the year I left school. I hated school so much so to be going to college instead was exciting. My favorite grade was #11 because I went to a brand new, modern high school. I loved third grade because my teacher made every unit experiential: dressing up, foods, 3D projects. I loved 11th grade. I had great teachers that left forever memories. 3rd grade was the best! 9th grade was the best, because that was the time I decided to get a career in science! I think 4th grade was my favorite. Thanks for the opportunity to win! 6th grade when the art classes for real creativity started, we were encouraged to do something original instead of everyone’s project looking the same, what an eye opener. My family moved to a different city when I was just going to start 8th grade. At first I thought it was awful but it ended up being the best year of school. I met awesome friends and did really well in my school work. Thanks for the great giveaway. I moved to a new school in the 5th Grade and my new teacher (Mr. Hard) was the best I ever had. He had cool experiments (a smoking clown to show us how bad smoking was for our lungs), he made brownies for us when anyone memorized all the states and their capitols. It was a fun learning year. I loved second grade especially when I was the TEACHER. The students got to learn to read well, write in cursive, and do basic life-skill ( quilting skill) math. Second grade is the greatest! Love the quilt. It is so cheerful looking and I like that it took you a day to do. Sometimes I need a quilt at the last minute. My favorite grade was third grade. We were new to the area and my teacher made me feel right at home. What a beautiful and fun quilt. Perfect for second grade! My favorite year was fourth grade. I could feel myself really settling into an academic groove. I asked to be moved to the advanced math group and my teacher approved it, with the caveat that I’d have to catch up to where the group was and do all the catch up work on my own. I liked the idea of teaching myself and furiously worked through a couple month’s exercises to catch up with the advanced group. It felt good to rise to the challenge. My favorite was 2nd grade due to my wonderful teacher that I still remember. Fourth grade was a good one as we were allowed to go to the all areas of the library for books to read, not just the ‘elementary’ section. Love the quilting on your project, and the colors! I loved seventh grade, we learnt Latin and I thought it was the neatest thing! My favorite grade was the third grade: I was living in Belgium and their school grading was very different. Each child was ranked at the end of the year and prizes were presented during a get-together involving parents, teachers, and students. I had been ranked 3rd in both first and second grade. My father challenged me to do better. At the end of third grade, I was ranked first, much to my delight!! The prizes were especially pleasing: a lovely pile of books! Without any television, books were my entertainment. In retrospect, I realize that ranking children that way is not desirable (particularly for those children with learning problems). However, it was special for me at the time. I love your mini! It’s so bright & colorful! I think my favorite grade was 2nd. I loved the teacher I had that year. Love your venture into 2nd grade, and Meadow Bloom is the perfect fabric for that year in school! The students are bright, cheerful and usually happy to be there. Funny though, my favorite year in school was 9th. I loved my friend circle and the subjects we studied. My favorite grade was 1st, as it was the beginning of a new chapter in my life. I love all grades. However I love 1st grade to get ones feel for school. Favorite is 11th, although 8th is looking good too. Oh I like them all! There are several I would make. Thank you for be part of this wonderful blog hop. I will be get this book. I love your fabric line. My favorite grade was first grade. My teacher was kind and compassionate. Even though he realized we were all new to the whole school thing, he expected us to always do our best. He brought out the best in all of his students. 4th grade is my favorite, I just have a thing for quilts that look like they are pointing! Thanks for the chance for a great prize! 1st, 4th, and 5th, all for the same reason: great teachers who loved what they did and loved their students. Thank you from the bottom of my heart, Miss Hershey, Miss Firpo, and Mrs. Scudder. Does college count?? That was my favorite. Or I would say 4th grade-I had a great teacher who introduced us to the whole world in so many different fun ways. your quilt is wonderful, I love the FMQ that gives it motion. And your binding is cool. My favorite teacher was Mr. Mitchel in 4th grade. He made all of us feel super special. He was unconventional in his teaching. Like for history people he would dress up like that person. He got involved with his students and was aware of our needs, strong points and weak points and would help with each. My favorite grade was first grade with Miss Miller. She made learning fun and made all of us feel important and loved. Your quilt is adorable. Love the circular quilting. I adored my first grade teacher. You could tell she loved being a teacher. Your quilt is lovely! I remembered how great it was in 4th grade when I learned to spell ‘important’. I thought I was just so very smart. But, really, I would have to pick second grade because I taught it for about 20 years of my career. I actually taught from Kindergarten through sixth grade but second grade is probably my very favorite. Your quilt came out so very cute and adorable! My favorite grade was 12th, because I could see the light at the end of the tunnel and I was ready to graduate and move on to College. I liked my 4th grade teacher Mrs. Clark the best as she instilled in me my love of reading. I’d have to say that fifth grade was among my faves at school. My teacher was imaginative with making Math fun. Sometimes during inclement weather we’d play ‘baseball’ in the classroom. She’d give you a Math problem and you had to solve it in your head to earn the base! Fun! Thanks! The fabric, the pattern, and oh, that quilting and binding! Simply delightful! My favorite school year was kindergarten, the crayons!!!!! 2nd grade because the teacher really turned me onto reading! 3rd grade. The teacher was special and I made a very good friend. i’d say 12th grade because my best friend & i had classes together which made math, spanish & physics a blast!! I loved 2nd grade- my teacher had a piano in our room and I remember singing lots of songs. Oh, and her daughter lived in NYC which I though was so glamorous! My senior year was my favorite. Good friends and so many fun things to do. I loved school. It is so hard to pick a favorite, easier to say the years I didn’t like!! And, I think my senior year was my favorite. I’d have to say 12th grade was my favorite. I was ready to be done with school and moving on to my next phase – college. 7th grade…I was so excited to be in junior high! I thought I was all grown up for sure. Thanks for the giveaway! My favorite grade was probably 3 & 4th. I attended a small private school where 2 grades were in one room so I had the same teacher 2 years in a row. I remember being sad to leave her classroom. I LOVE this book! The earlier years were definitely the best, K-3. Seems like I had one issue or another in any of the following grades. Love this quilt! I did circular quilting on a recent quilt I made, and I love the impact it has on the quilt. My favorite grade was 2nd grade because of the awesome teacher (who also taught my two daughters). Every time I happen to see her, she still has a big hug for me! I like the grade 1 quilt – always looking for ideas for my mini charms!! Love the quilting on your quilt ???? Grade 11 – got my license and my first car! Ok, so that really doesn’t have much to do with school but it was a great time! Love that you were able to complete the entire top in one day! I think 4th grade was my favorite, because Sister Gabriel was my favorite teacher. She made a very favorable impression on me! ps. I just have to say that I love Meadowbloom… the riot of yummy colors and prints are totally lovely!! Wow, I love this book! There are so many beautiful patterns to choose from it is hard to pick just one. My 12th grade year was my favorite because that is when I met my husband. We just celebrated our 38th wedding anniversary yesterday! This is a super concept for a quilting book. As a teacher, I would so very much enjoy making these for my grandchildren as they grow up. My favorite grade in school was 1st grade when I knew my teacher was a *magician* because she taught me how to read! My favorite grade was 4th grade. I had a great teacher and lots of friends and was full of confidence–the polar opposite of middle school LOL! Wow, your quilt is beautiful and I am amazed that you completed it in a day. My favorite school year was 6th grade, we moved every year before that and this was the beginning of making friends that I graduated with. What a beautiful quilt. I would have to say that 2nd grade was my favorite grade in school. Not really hard and still having fun. Plus I had the best teacher ever. Thanks so much for the chance to win the giveaway! 7th grade was my favorite. A new school (junior high) and we changed classes and teachers for each subject. Loved having lots of different teachers and classmates. I love your quilt. My favorite year of school was probably first grade. I couldn’t wait to be in school all day like my brothers! Lovely quilt! I think my favorite grade was the 8th grade, because we were the oldest kids at the school. The next year we were going to be the youngest. Thanks for the chance to win fabric. My favourite grade was grade 3 because that year I had the best teacher ever, Miss Winters. She made everyone in the class feel special! I was a weird kid, I loved school, probably because I was the baby of the family, and wanted to be like everyone else-going to school.Thanks for the chance to win, and love your quilt! My favorite grade was 10th grade when I met my best friend for life. We both took typing and shorthand together and loved our teacher. I didn’t have any one favorite year over the rest, but I did love math. I loved it so much I became a math teacher. 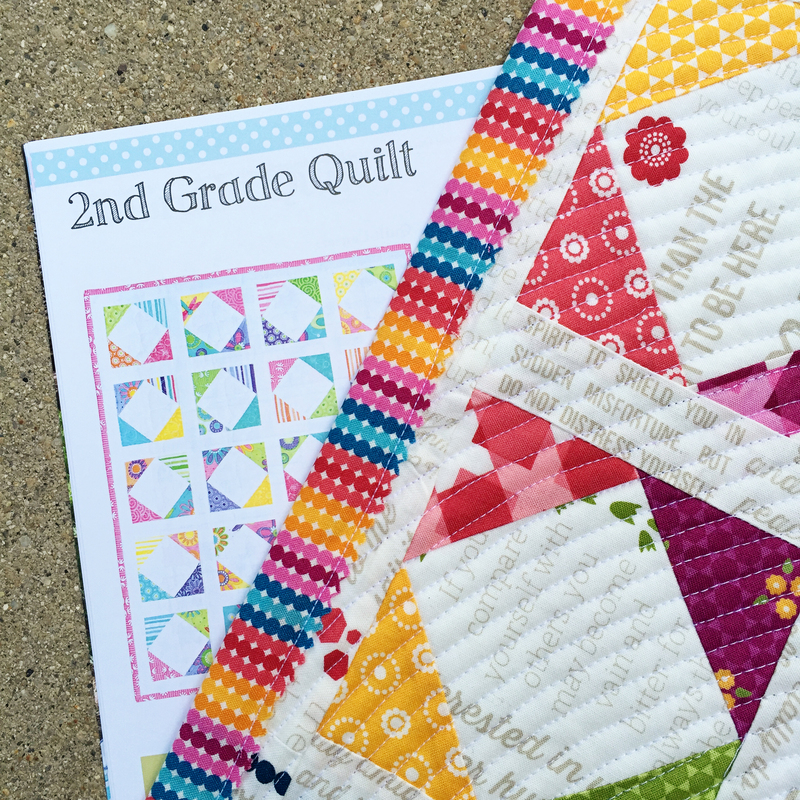 Love your quilt with Meadowbloom, and your quilting, and your pinked edge binding! My favorite grade was 4th. Wonderful teacher, learned our state history. Good stuff. Thanks for showing us your gorgeous version of 2nd grade! I don’t know what grade was really favorite, but since we’re talking second grade, I have a memory of my nice teacher, telling everyone how pretty I looked in my brand new eye glasses that I had to start wearing for the first time! I have to say 10th Grade was my Favorite year…then thru High School……I made a dear friend the summer before 19th Grade…and we are still friends to this day! She was soooo Special…like a Sister…and we made so many Heart Memories together! Thanks for chance to win your Give-a-way too! Love your 2nd Grade Quilt too…sooo cool! Grade 12! I was more confident and independent and life held so many possibilities. I heart meadow bloom sooooooo much! I think my favorite grade was 7th. That was the year I got to take Home Ec for the first time and really developed my love of sewing. I really like the 11th Grade, but will definitely make more than just one of these. Your quilt is beautiful. Would love to win some fabric. Thanks for the opportunity to win. Got my fingers crossed. I llove Meadow Blossom. I loved second grade. I had the best teacher ever! Thanks for sharing your beautiful fabric and thanks for the post on this delightful quilt! I think I liked 6th grade best because we had a wonderful, strict teacher and I learned a lot. Thanks! Fifth grade was my favorite because Mrs. Clemens always read to us while we did our Spelling. I am an avid reader now and tried to instill that love in my students and own children. My favorite grade was 8th grade; they were “top dogs” of the 7th graders, before we all moved to a different school for high school! Our school was old: it had a basement where the lunchroom & home ec class was, and a huge staircase on two sides going up to the top floor where the study hall & library was. We had regular fire drills where kids went down an outside tube from the top floor down to safety–fun but scary! I really liked 4th grade the best! I loved school period. To this day I like learning new things and techniques. I love your quilt first off! I have to say I think second grade was my favorite. Mrs. Barnhart, my teacher was so sweet, I was new in class we had just moved, and she made sure the kids accepted me. a quilt finished in a day!!! wow, i wish i had your energy. lol any grade in high school was my favorite. My favorite grade was second grade. My teacher was kind and patient. The other kids in the class were fun and creative. Every day was fun and enjoyable. I loved going to school that year. 4th grade was my favorite…the teacher introduced the class to Madeline L’Engle’s book A Wrinkle In Time…and i just fell in love with all books! Wow! You finished in 1 day!!!!!! I enjoyed my Junior year most when we studied the American Civil War more in depth. My favourite was probably year 6 with Mrs Waite, she always managed to make everything interesting and I don’t remember her ever loosing her temper either. She was wonderful and used to live in our house – my parent bought it from her and her husband! My favorite is the 8th grade, but I LOVE your quilt too! I guess 7th grade, hard to choose. Second grade, I started at a new school (public not catholic) and I had a lovely happy teacher. And I didn’t have to wear that itchy wool uniform any longer. What a terrific quilt, thanks for the chance to win. I loved Kindergarten, I couldn’t wait to start school – I couldn’t wait to learn to read and write. I learnt to read and found one of my true passions in life – books. Wonderful. Picking a favorite grade in school would be hard. We moved around a bit and I went to 6 difference schools from K-12, but I’d have to say that my 10th grade year was probably my most memorable. My favorite grade in school was seventh grade. I loved that we got to play in the band. I learned to play fench horn and made lots of great friends that year! I think my favorite year of school was 5th grade, because I met my life-long best friend then. I wanted to add that the quilting on your piece really adds a visual element that makes the piece. My favorite grade was the 8th grade. Lots of fun and interesting school work. I had a great teacher who encouraged everyone to do their best. Favorite grade was all of them. I loved school! If I have to choose a favoritest of them all I guess I would choose my senior year. Fourth year of Home ec. third year of drafting and I got to be a candy stripper that year. Lots of stuff going on. Thanks for a great give-away. I liked fourth grade because I had a wonderful teacher. Oh, dear! School was so many years ago that it’s hard to remember! I adored school-all that reading, writing and arithmetic. I guess if I had to pick one year of school as my favorite, it would be third grade. I love Meadowbloom-and you’re so sweet to give us a chance to win some! I loved the 6th grade because I had a great teacher name Mr. Turner. He inspired me to become a teacher myself and I am always thankful for him! I loved 12th grade. I knew that I would go to college, but I was so ready to be done with high school. Your project is beautiful; thanks so much for a chance to win some fabric!! That is a lovely quilt. I don’t know why we feel we have to do the harder things when the simpler ones are just as beautiful, and sometimes even more so. My senior year of high school was my favorite. I felt like I was on top of the world – almost done with high school and looking forward to my life ahead. I remember 5th grade as my favorite year. I had just moved to a new school in a much better neighborhood. I remember thinking that the school was so new and CLEAN. The other kids looked happy and everything was in good condition. The teachers looked like they enjoyed coming to work. It all made for a happy experience! First grade, with Miss Merryman, was my favorite!! Miss Merryman lived up to her name! She was the best teacher EVER!! That year was also the year my mom, sister, and I moved in with my grandfather so my mom could go back to school. He was a great man and I have so many great memories from those years!! Thank you for the opportunity to own such an awesome book and for bringing to the surface such great memories!! Second grade for me because my teacher took me to see my first opera. My favorite was grade 11, I finally made some friends, my first boyfriend, first kiss … I came out of m shell. Beautiful quilt, thanks for the giveaway ! Lily made an excellent choice for your ‘return to quilting’ – Second Grade looks wonderful in that fabric! My favorite grade was third – great teacher, good friends and fun stuff to learn! I think my favorite grade was 8th grade; I had some great teachers that year. I would love to win some Meadowbloom! Thanks for the chance to win! My favorite grade was the 8th grade when I had a wonderful math teacher! Is that binding pinked? Very clever and cute. My Senior (12th grade) was the best. So excited for the future and to be a “grown up”. I wish I knew then what I know now, I’d have surely slowed things done a bit. My favorite was 2nd grade. My teacher, Mrs. Penney picked on me mercilessly — all in fun. My favorite memory was when she put me in the trash can for talking too much . . .
Well, I suppose 12th grade was my favorite as I was looking forward to going to college!